Exhibitions and a quilting conference in our region | Canberra Quilters Inc. 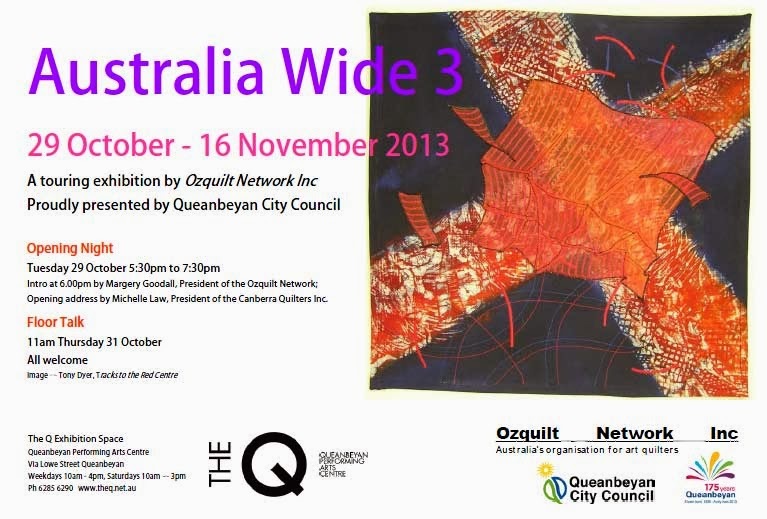 There are some exhibition coming up in the next few weeks and months, under the auspices of Ozquilt Network and Craft ACT. Some of our members are involved in this. See exciting, beautiful and thought-provoking art quilts from new and established contemporary textile artists. With entries from across Australia and afield guest curator Valerie Kirk, Head of Textiles at the Australian National University, selected 20 quilts representing a wide range of approaches. Valerie Kirk and visiting exhibition artists will give floor talks to delegates at Ozquilt Network’s National Conference on Saturday 2 November. The Conference will also provide several exclusive pre and post-conference events for delegates during the period 29th October to Sunday 3 November. For further information and registration see www.ozquiltnetwork.org.au.